Nail Art: Texture + Multichrome = ??Awesome?? Hi, me again! 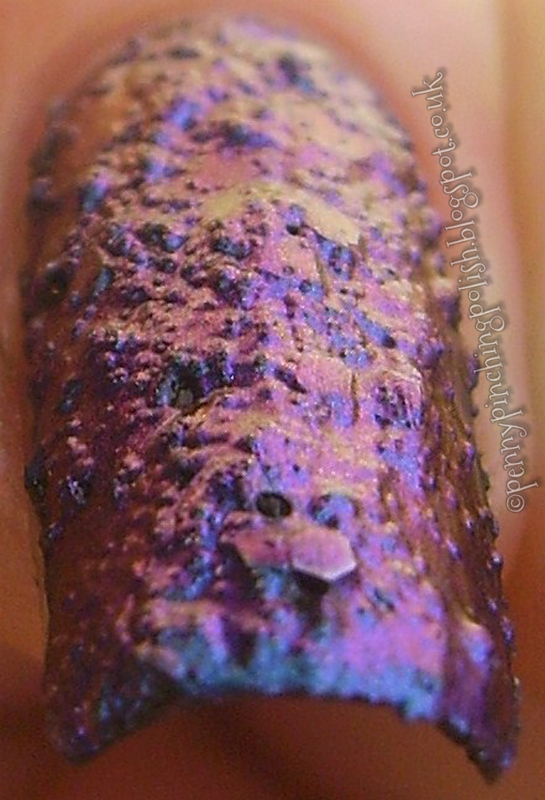 Here are, as promised earlier, the results of my texture + multichrome = ??awesome?? experiment. There are a fair few pictures for this too, so I'll put the rest after the jump like I usually do. I decided to try it over 2 different textures; the left is a black 'sand' texture by Tribal from Born Pretty Store, and the right is one of those beaded textures by Seventeen, also in black. I'm not a fan of this at all by itself, but it was useful to have one for this. I used 2 coats of Birefringence over the textures when they were dry. I like the way the 'sand' texture looks, I think it's awesome, but I'm really on the fence about the beaded one. There's no doubt that this is the prettiest beaded texture I've ever seen, and I am kind of fascinated with how it looks, but can't really decide whether I like it or not. What do you guys think - here's a closer shot of it to help you decide. It kind of looks like some sort of magnificently colourful space debris landed on my nail!